MVPs shouldn't be the quickest output of your product, but a small metric to test customer reaction. Kinda like those samples of Kung Pao chicken in the mall food court. Minimum Viable Product (MVP) is one of the most overused and misunderstood terms in product development. It’s all the rage: everybody from startups to multinationals are busy building MVPs, or at least they have convinced themselves that that’s what they are up to. But is the MVP the panacea to cure all product development woes or is it a just the latest boardroom fidget spinner? So What Exactly Is an MVP? A Minimum Viable Product is the smallest thing you can build that delivers customer value and tests your idea or hypothesis. It is by no means a finished product. It is simply the fastest way to start learning how to build a sustainable business or product with the minimum amount of effort. We’ve all heard the phrase, “if you build it, they will come.” Unfortunately, that simply is not true in the product world. In order to make sure that you build something customers really want you need to find your potential customers and test your product idea with them. An MVP puts your idea in the hands of customers to find out if they really want it and to understand where the gaps lie. An old coworker, Neil Killick, sums it up well with this tweet. A common misconception is that an MVP consists of the minimum set of features deemed necessary for a working software product, with the primary goal of bringing it to market quickly. This approach is incorrect, as there is an over-emphasis on speedy delivery and time to market, as opposed to focusing on customer and market acceptance. Rapid development is important, but only to the extent that learning and research objectives can be obtained quickly. Here are some great examples of MVP’s done right. Groupon started as a platform to bring people together to accomplish things they couldn’t do alone, like fundraising or boycotting a retailer. Their first concept didn’t take off and they famously developed a new MVP in just two days. 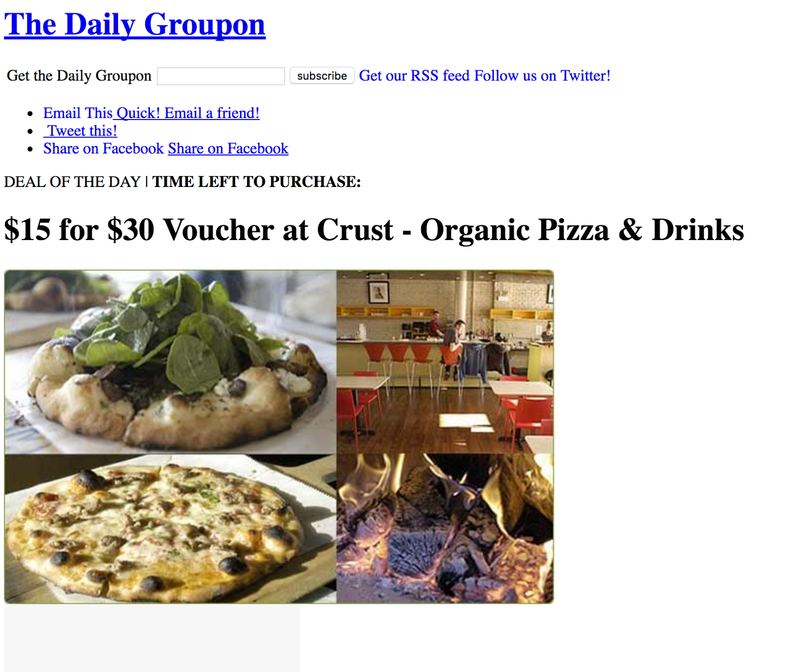 They published a simple Wordpress blog called “The Daily Groupon” and began posting deals each day manually. If someone signed up for a particular deal, the team would generate a PDF document and email it out. Their low tech MVP verified that there was a market worth pursuing . They spent the next few months focusing on seeing how many users they could get as quickly as possible in order to validate the idea, and then started looking into the business side of the company once it was clear that they were onto something big. Buffer is an app that lets you schedule posts across your multiple social network in one place. When starting out, Joel Gascoigne, Buffer’s founder, didn’t want to get stuck building a product no one wanted to use. So he began with a simple MVP. 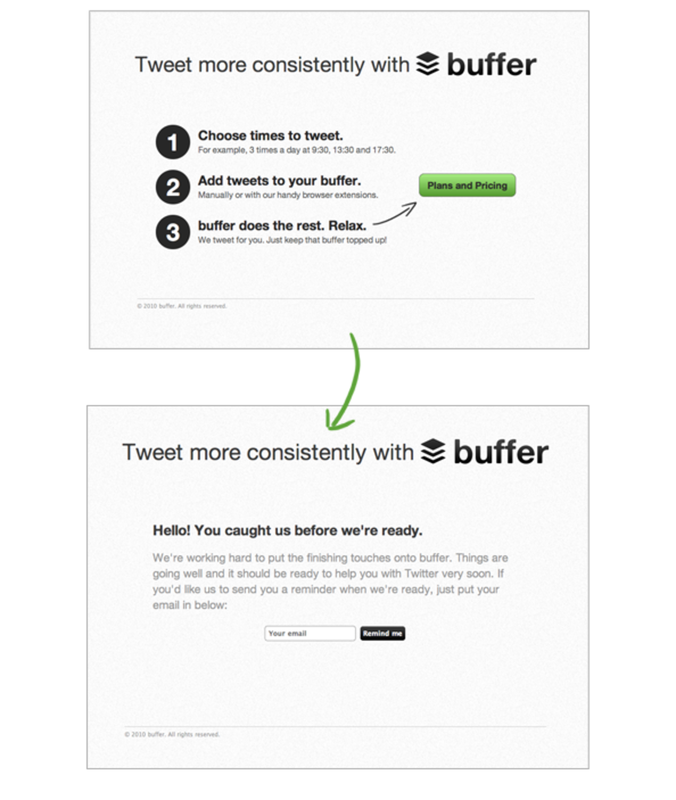 Buffer published a simple landing page. It explained what Buffer was and how it would work, encouraged people to sign up and offered a plans and pricing button for people to click on if they were interested. When they did, however, they were shown a short message explaining they weren’t quite ready yet and that people should sign up for updates. Joel used the email addresses received from the signup form to start conversations with the potential users of the app, gaining valuable feedback and insight into what they w ould want. Pebble is an e-paper watch for smart phones. 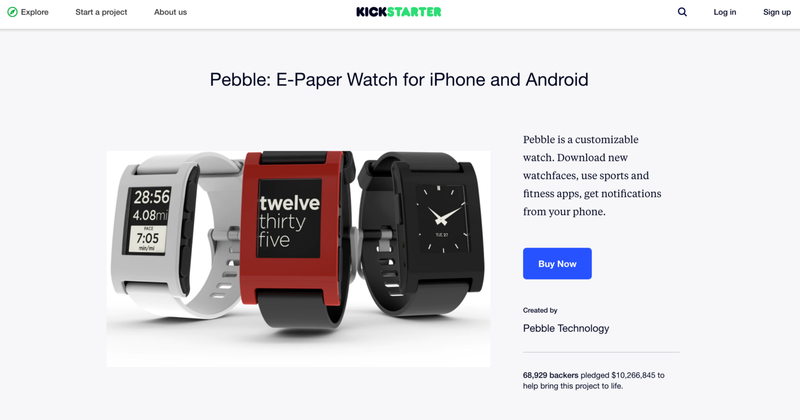 Pebble famously raised over $10M in preorders for their watch before it was ever built through the Kickstarter crowdfunding page. Funders were rewarded with a promise of the product once the minimum funding goal was reached. While Buffer gauged peoples interest by publishing a landing page for their yet to be developed product, Pebble took their MVP a step further. They not only validated their business idea but they even persuaded the public to pay for their product before it was built! Before the software engineering team at Dropbox tackled the hugely complex task of building an easy-to-use file synching application that run on many different platforms they needed to be sure there was a market for their idea. Drew Houston, the CEO, famously made this 3-minute YouTube video demonstration how the technology would work, it was targeted at a community of technology early adopters. Drew narrated the video personally. He posted it to HackerNews and overnight they went from 5,000 to 75,000 people on their beta list. An MVP is a strategy for learning about your customers and finding out if your product idea has got legs. The primary goal of an MVP is not to bring a product to market as quickly as possible but to make sure you bring the right product to market by understanding your customers needs. Published at DZone with permission of Aidan Casey . See the original article here.